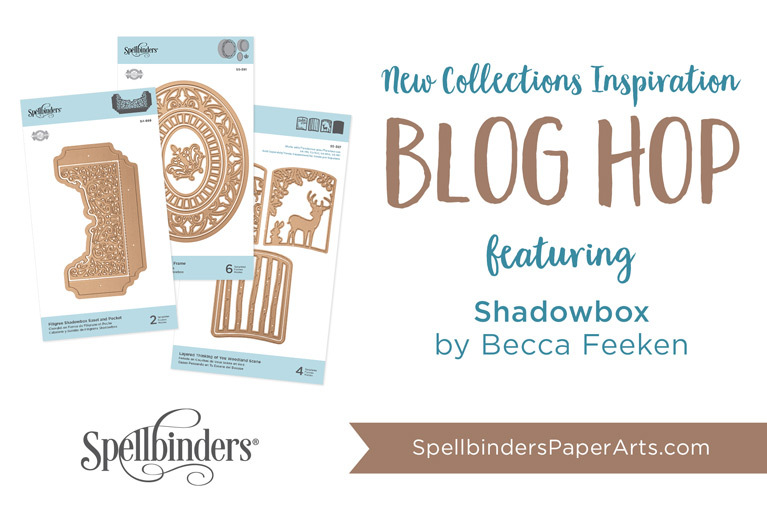 Hi there, Becca Feeken with Amazing Paper Grace here. I’m so tickled to be introducing my newest collection Shadowbox Vignettes and in particular Shadowbox Vignettes Adjustable Frame – 1″. Can I just tell you that I’m smitten? Here’s why. I’m introducing three new Adjustable Shadowbox Frames that will make Frames any size, any dimension. And if that’s not enough, I also designed a whole host of embellishments that can be used with Shadowbox Frames or with stand-alone cards. I’m not kidding when I say you can use the frames for a gazillion different things. Kids artwork on fridge, a mailing caddy for a dimensional card, a diorama – I could go on. But that’s not why I’m so tickled today, I’m tickled because I fell head over heels in love with making this project today. Indulge me friends, I took a lot of pictures. 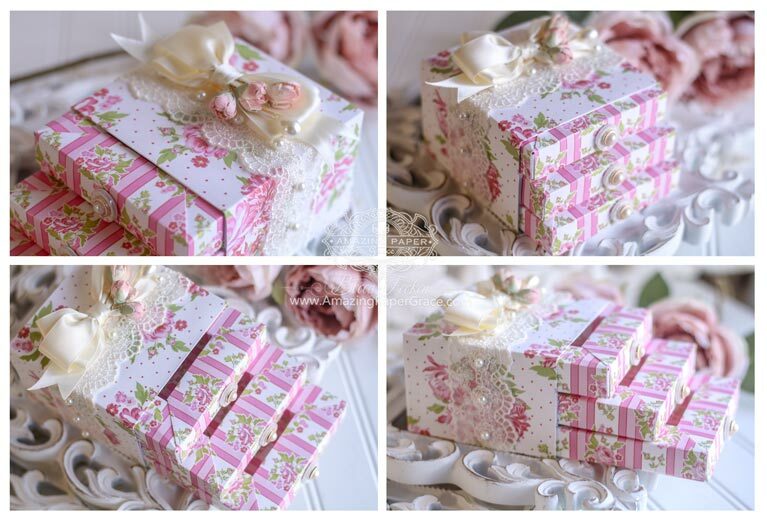 Meet my new style of gift box made from frames. That’s right, frames got awesome enough to take the gift giving scene away from the plain ole box. 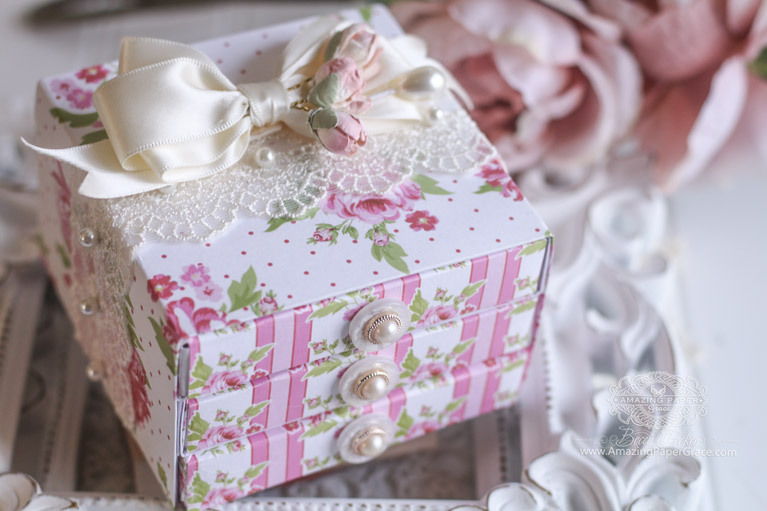 My project today is using Shadowbox Vignettes Adjustable Frame – 1″ to make the three sweet little drawers that live in the chest. I’ve pulled out the drawers a little bit so that you can see their dimension. And here the drawers are all pushed in and you can see the little buttons I added as handles. Now that I know the size needed for these drawers I think my button hunting is going to be a little addictive! Right smack in the middle of all the fun are these sweet little 1″ frames!! See, I told ya! 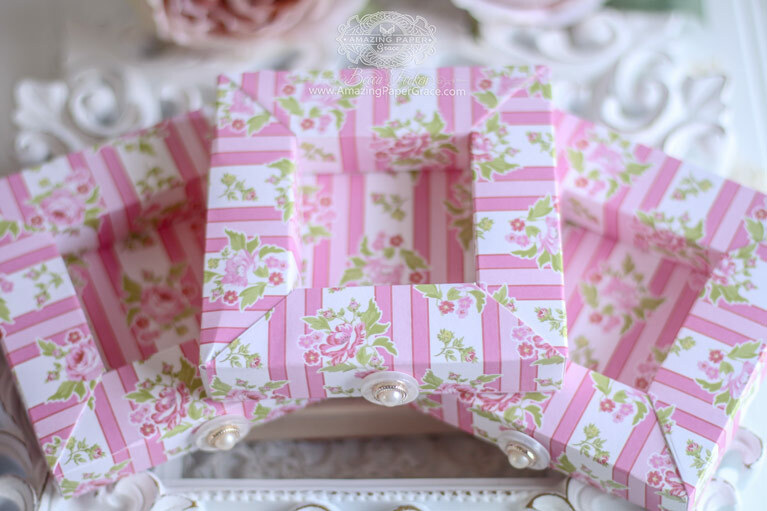 These frames are the basis for so many fun 3D projects and are a must add to your toolbox. Here I’ve made them 4″ x 4″ but you could make them rectangular if you like because they can be made any size your heart desires. With the 1″ frame you cut 4″ strips. Cut the length of the 4″ strip to match the dimension you want your frame. Then, apply two matching dies to the edge of your paper. The matching bookended dies will cut the leg of your frame and prep the edges for perfect assembly. I’ll be linking a video at the end of my post to walk you though! 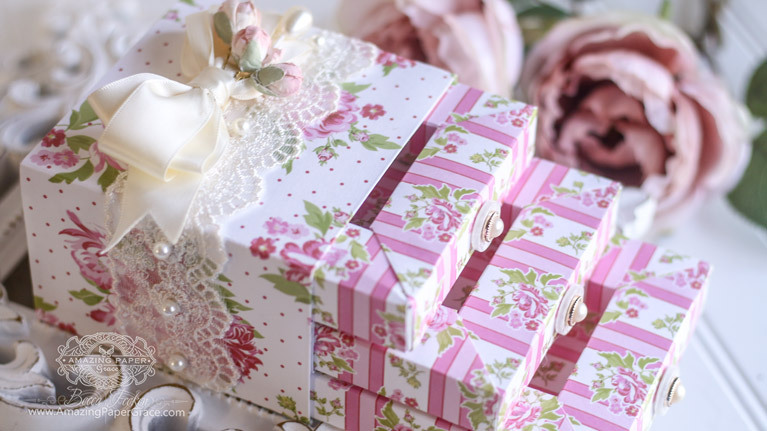 You might just wonder what would fit into such a lovely but little box . . .
Then Bam! Look at what treasures you can store there! 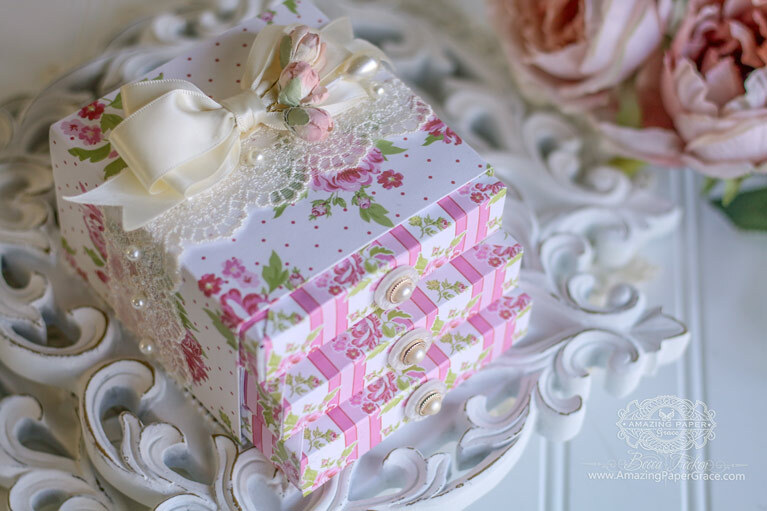 My idea is to give a gift trio of jewelry and to create a box where the first drawer holds the earrings you are giving as a gift, the second drawer holds the bracelet you are giving as a gift and the third drawer holds the necklace you are giving as a gift. You can make the trays any size you like. Can you imagine the surprise? Now, prepare to be amazed! 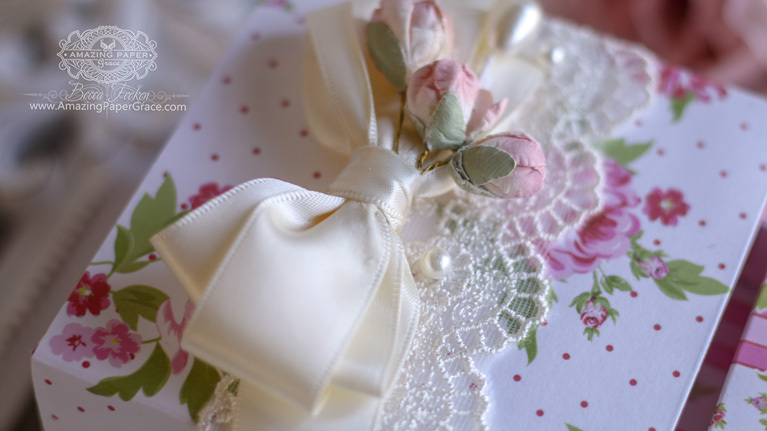 Below I’m sharing the blog hop list. You will want to visit everyone on the list. Be sure to leave a comment because it will put you in the running to win some gift certificates. To celebrate this release, we are giving away a $50 gift certificate to 3 lucky blog readers – selected from the comments across all of the blogs in the hop. Giveaway closes on Sunday, February 10th 11:59 pm EDT. Winners will be announced in our blog hop post the following Monday. The winner is responsible for shipping cost, duties and taxes. Don’t stop here, lol! After you’ve seen the last person on this list, guess what – MORE PRIZES! My creative team and I kicked off Shadowbox Vignettes two days ago with some sweet inspiration. For our hop, I’m giving away 3 Dies plus the inspiration along the way is amazing. There are 6 more blogs to leave comments on to be in the running for the dies – it all begins ———–> HERE. For my regular sweet, sweet tribe – thanks for an amazing week; you all ground me. For new eyes that I’m meeting for the first time, welcome! 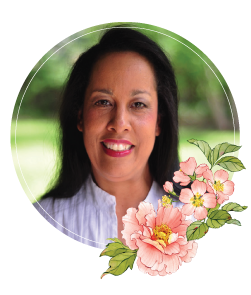 I hope you like my creations and design style and I’m pleased you took a moment of your time to stop by. Please come again, or better yet, stay a while — I’m looking forward to meeting you! Good morning Becca, wow wow wow!!! You just take my breath away ? All I can say is just WOW! I have never seen anyone showcase their dies so beautifully. 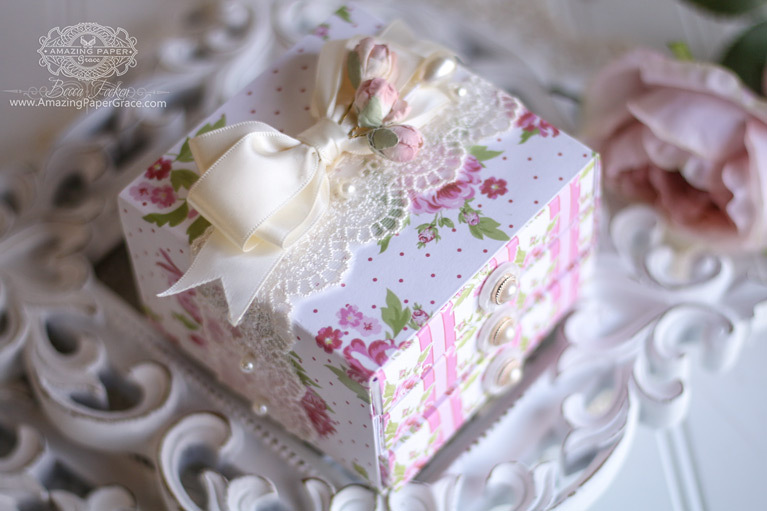 I really loved each and every project that has been created using the Shadow Box Collection. The designs are so brilliant and innovative, and I love how each die has so many possibilities. I think WOW is definitely the description of the day! These are so adorable! You clever, clever lady! I will look through the blog hop when I have time. wonderful display on a dresser. Also a safe storage for bits. Ok!!!! NOW YOU HAVE MY ATTENTION ? So clever and so very very pretty. Oh my goodness, Becca, do you read my thoughts or what? When I saw your creation, I had goosebumps!!! This is so adorable, I can’t even express how much I love it. I am over-the-moon to see all the creativity this collection inspires. Becca, I sincerely thank you for designing a useful die that will help mail all my dimensional cards!!! It goes without saying that this collection is irresistible! Thank you for the opportunity to win! 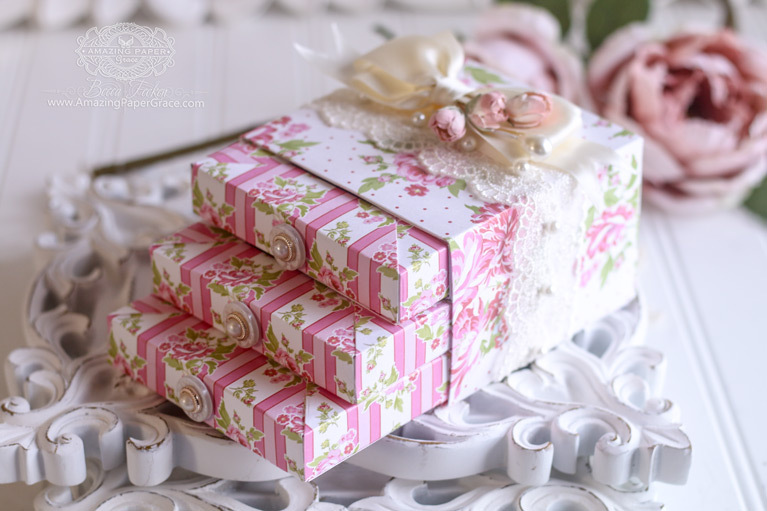 I’m so in love with the shadowbox die and you’ve given us a whole new way to use them with your stacked drawers!!!!!! Hi Becca! I just spent a good part of an hour hopping to each post to see all of the projects using your newly released dies. You must be so happy with all of the amazing projects that fellow crafters created! You have designed another beautiful release. So happy for you! 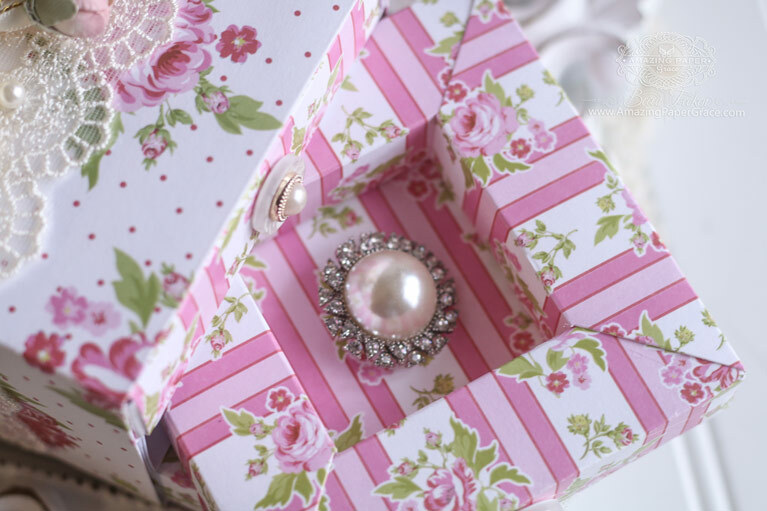 love the boxes with a box project, pretty in pink.